Building trust with your customers is an important investment for your brand. Once broken, customer trust is irretrievable. Customers need to feel that they are being listened to and supported, and that’s before they even agree to spend their hard-earned cash with you. Don’t lose sight of your customers – make sure you always have their back. Here are six crucial things they need from you and your online store – so don’t disappoint. Great branding and thoughtful web design build trust and brand consideration. Great branding isn’t about how cool you are – it’s about how cool your customers think you are (and how much your products are worth to them). Mismatched messaging, an amateurish logo, bad copy – just some of the main brand killers. It can be hard to quantify great branding, but bad branding will stick out like a sore thumb online. In the days of slick website design templates, custom animations, simple image editing, and awesome online content – there are no excuses for sloppy branding. You need to invest in quality copywriting– it’s essential for your brand. Don’t spend hours tweaking design elements and logos and then just throw up any old product description or copy. Invest in copy that makes people happy and that genuinely reflects your values as a brand. Play around with different content formats and types – blogging, vlogging, infographics – add lots of texture to your content. If you aren’t sure about something – ask. There are loads of branding experts out there who can help you find user focus groups for your concepts. Remember to refresh your branding from time to time. Is it time for a new logo? Here are some classic logo redesigns you might recognize– learn your lessons from them. A bad rebrand can be disastrous. Usability and UX design are just as important as clever wordplay and animations – make sure that your website is easy to use, and that you haven’t sacrificed usability for the sake of gimmicks. In eCommerce, a clear website structure with simple menus and plenty of product imagery are a must-have. 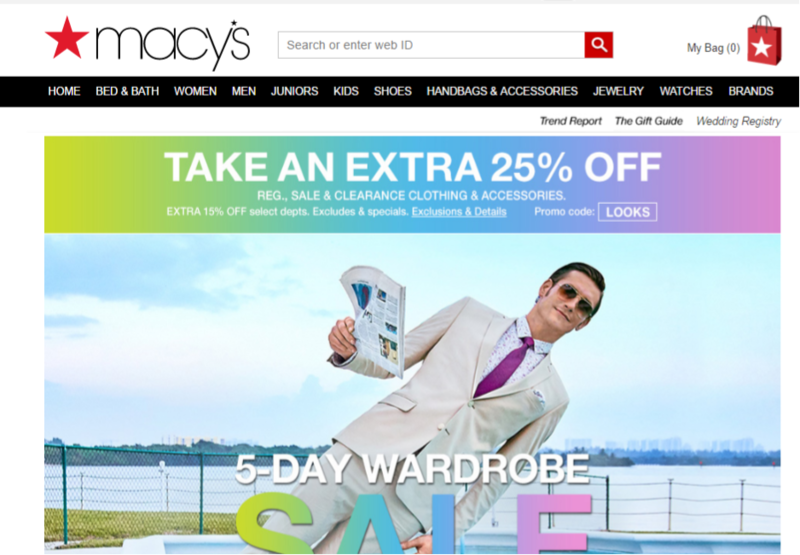 Even big brands like Macy’s know that the key to great eCommerce design is a simple menu structure, and a website that lets the products (and offers) do the talking. The simple colors and layout are focused on converting customers, not showing off. Consistency in brand tone and imagery is all about what makes sense for your audience. 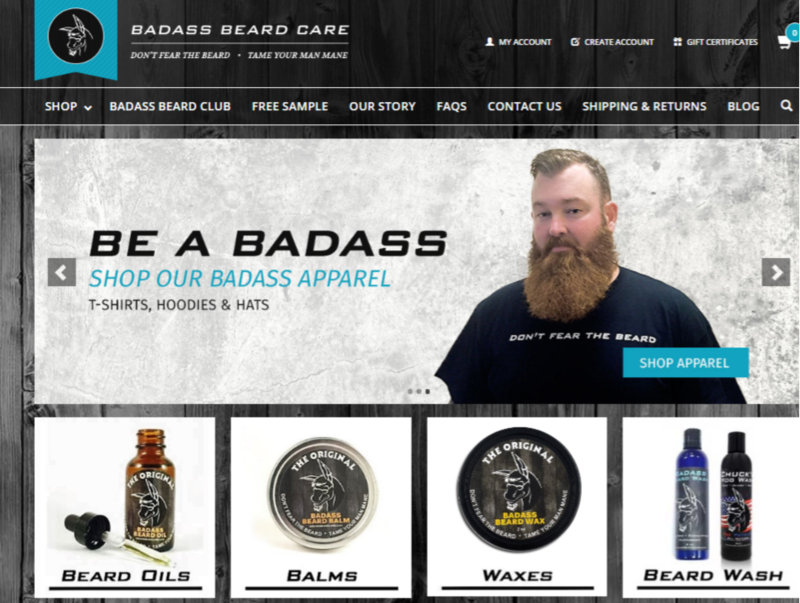 A smaller eCommerce venture like Badass Beard Care knows that their unique, ‘tough guy’ branding will keep customer conversions high (and beard enthusiasts happy). Badass recognizes that their customers prefer straight-talking product images and names; building a relationship founded on trust and consistent branding. Whether you go for short and snappy quotes or in-depth case studies, customer testimonials are in an important marker of trust. Be mindful of having too many testimonials (this might look fake, and you will overload the user), or having testimonials that offer little value (bland, generic, could be anyone). Focus on really insightful commentary about how your products or services have changed people’s lives. Video testimonials are a great way to engage potential customers, but the videos have to be interesting and you need people with charisma for them to work. Customer logos help build confidence – especially for B2B sellers, having logos of noteworthy brands and businesses on your website helps you build a legitimate brand. Big corporate clients may not give you clearance to use their logo – be mindful of restrictions. Quotes are a brilliant way to quickly showcase your product benefits and clientele – just make sure that the quotes actually say something – “this product is great” doesn’t really offer much value. At the same time, you don’t want to edit out the personality from the quotes either. Try asking leading questions to get people to say more. What is being said about your store and products by others can be just as important for customers as what you say. Customers like to see how others have gotten on with you in the past. Make sure that you have positive online reviews in a variety of places, from Amazon listings to social media. Reviews are a great way for customers to see how other people (‘just like me’) have succeeded with your product or service. Again, the best reviews are specific and unique – though you probably won’t be able to influence reviews in the same way as you can testimonials. Reviews on a review website are great – and you can pull in reviews and stats from a third party website through to your own domain with an integration. You can also do that for your Amazon reviews if you have any; let Amazon do the hard work! Get social media reviews on your store’s Facebook and Google My Business listings, but be wary of all your staff, family, and friends leaving you empty five-star reviews. Google especially is good at knowing when a review has been falsified which can lead to losing all of your hard-earned reviews. It’s probably best if your review average is more like 4.8 or 4.9 – authenticity is key! Getting bad reviews online? It’s important that you respond, and show customers that you are listening – don’t attack people’s character: be careful about defamation. People shopping online need to know that their money is safe with you! Make sure that you make security and privacy central to your online sales strategy, and make them both explicit too. A secure payment portal is an eCommerce must-have; try to offer your customers more than one convenient way to pay. Use a secure, encrypted connection and display trust signals like payment logos prominently. Encourage people to save payment details for later, but always verify card payments with the card issuer if you can. PayPal is a popular form of online payment and is trusted by many thanks to its generous buyer protection. Another payment processor we trust for eCommerce is Stripe. Storing data through your website requires extra security and solid customer data management by you. An SSL certificate is an easy way to ensure the data accessed and stored through your website is secure via encryption. You can purchase one from nearly any website hosting company. Order confirmation emails and tracking emails should be immediately generated with all the necessary purchase details. Make following up with your customer support team regarding a recent order secure by asking the customer to verify their details. (And don’t automatically add all new customers to a mailing list if they haven’t asked to be signed up for one). A few customer quotes on a payment page and the ability to immediately connect with the support team either on the phone or through chat messaging are an example of small things that go a long way when it comes to secure payments! Customer service affects prospects and leads, just as much as it affects existing customers. A lack of customer service functionality (and clear contact details) can put careful customers off. Generally, the more expensive, and the more technologically complex a purchase is; the more support your visitors are going to need. They will often need support before they commit to a sale. Include comprehensive support details on your website and introduce your support team on your company pages. Try to humanize your support team with some friendly images (use ACTUAL support team members, not just a random stock photo). Technology companies need to do a lot of reassuring, so Shopify makes sure that their 24/7 customer support is at the core of their sales message on their landing page. The fun team photo instantly gives the support team a real and friendly face, and the range of people shows the eCommerce brand’s commitment to diversity and inclusivity. For a technology product that is going to impact someone’s ability to do business effectively, 24/7 friendly support is key – and people need to feel confident that when they call, they get to deal with a real person. But even if you’re not operating in the tech niche – invest some time into making your customer support a value proposition – it could swing the pendulum your way when customers are eyeing your competitors. Sometimes customer support also means developing a user-friendly resource hub. 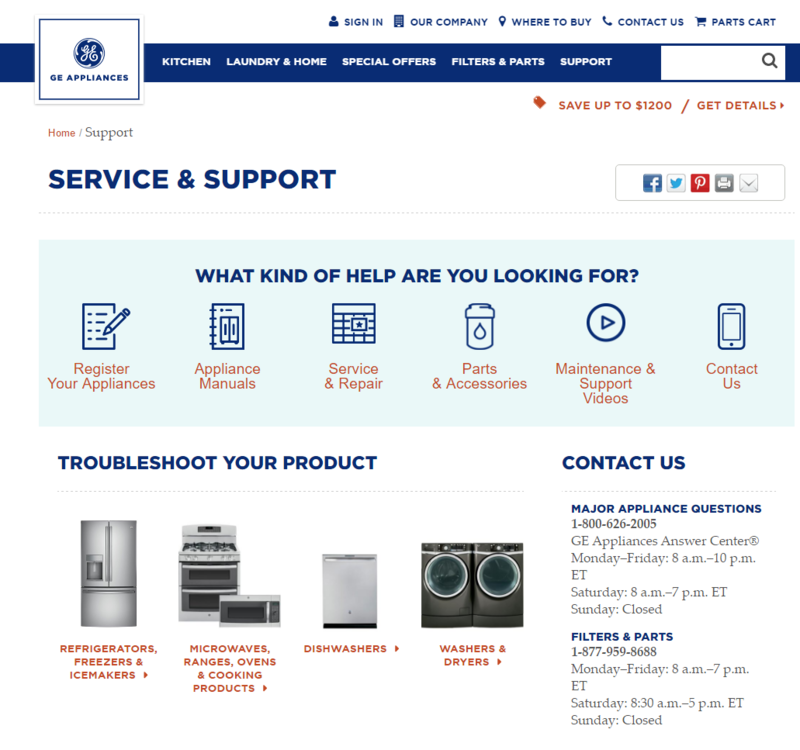 GE Appliances have super clear and informative support pages – allowing users to quickly self-identify and be taken to a relevant part of the website for more information. The page also offers users the chance to select their specific appliance – good customer support is all about giving people different options and routes to follow. It’s always a good idea to have support information online so that visitors can try to figure things out before they ring you. GE makes sure that their contact phone numbers are prominent on their support pages. Always keep contact details visible and where customers can see them – nothing beats a conversation with a real human being. Customers often stumble onto brands on social media channels, and if your Instagram account or Twitter feed is not on brand, you may be in trouble. Credible and engaging social media content is a huge confidence builder in our age of social commerce. People want to see brands engaging in conversations – don’t just broadcast. Social media is a great place for brand PR and endorsements. Work with online influencers on marketing campaigns. Let loose and live a little on social – a little cheekiness is fine. Social media buttons and sharing functions throughout your website. A healthy amount of followers and shares. Clear branding – unique featured images. Plenty of engagement with followers: comments, shoutouts, retweets. If anyone mentions your brand or product – engage with them. Informational content about your products. Make sure that your social media strategy is at the core of your marketing plan. It’s fine to automate and outsource certain elements of social media, but you need tight guidelines and procedures for people to adhere to. Social media is a very public arena and there could be serious consequences for your brand if it isn’t managed with care. There are loads of different things a website needs to do – but your core strategy needs to be focused on users and their needs. A brand is in the eyes of the beholder after all! What digital marketing strategy are you excited to try out in 2017? Whether you need assistance with your social media presence or a complete makeover of your branding, our creative Square 205 team can help. Contact us so we can start crafting meaningful, effective digital marketing strategies for your brand. Thanks, Patrick Foster, for the collaboration on this informative blog! Patrick is an eCommerce entrepreneur and writer for eCommerceTips.org. You can follow him on Twitter for more great engaging eCommerce content!